If I had to pick perhaps the most important resource to lead you through a successful capital campaign, it would be the gift range chart. You may also know it as a gift table. If you’ve been through a capital campaign before, you are likely familiar with this important tool. If you use this tool correctly, you’re well on your way to leading a successful campaign. So What is a Gift Range Chart? It makes sense that a gift range chart is the principal tool for your campaign. It provides a framework for the number of gifts, at each gift amount, that you’ll need for a successful campaign. 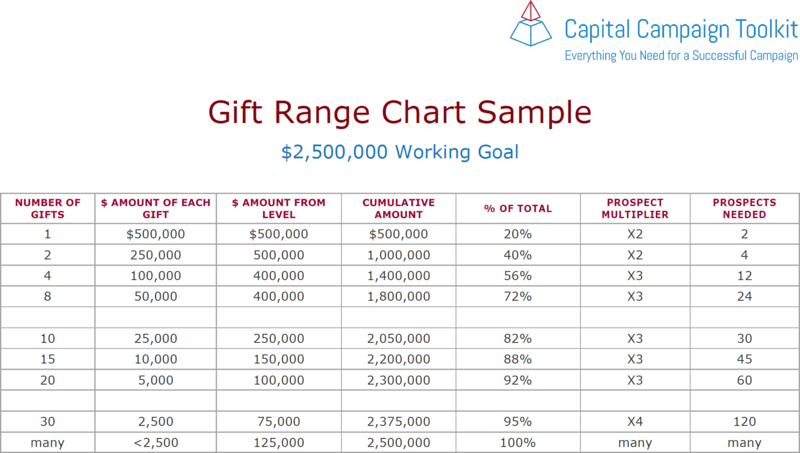 The gift range chart is the primary tool for your campaign because it will clarify your goal and help you determine your chances for success at a specific goal amount. In the sample above, note that the first seven gifts gets us to $1.4 Million — more than halfway toward the goal. Similarly, the first 15 gifts gets us to $1.8 Million, or 72% of the way to the goal. All gifts under $25,000 comprise less than 30% of the goal. It’s critical to get the leadership level gifts during the quiet phase of your campaign. This will help you determine when and how you will make it to your goal. Of course, the amounts on this chart are for example only. Your Gift Range Chart will reflect the size of your donor base. The smaller your donor base, the larger the gifts in the top of the chart will have to be. Once you’ve created a gift range chart for your campaign, you’ll develop a “depth chart” which will attach specific prospective donor names to each gift required for a successful campaign. These will help you develop a gift range chart that’s appropriate for your organization and your campaign. 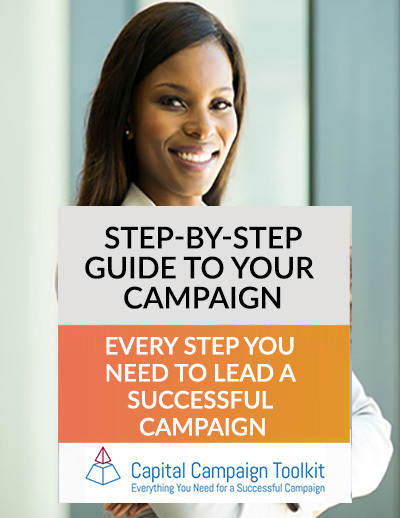 Don’t start on your campaign without using these critical tools! Simply add the appropriate number of zeros to the sample shown. And, we do provide a gift range chart calculator for Toolkit members to help you with this process.